October 12th 2008 - XMonitor Source Code & Project files 1.9.7 now available. This is a complete package of everything required to build a working copy, including REALbasic 5.5.5 & all plugins. October 7th 2006 - XMonitor 1.9.7 now available. Earned 5 out of 5 Rating Award by BrotherSoft. BrotherSoft Review Staff gives this product an Editors Pick Award because it is easy to use, has a professional-looking interface, and it is excellent compared to other programs in this section. Rated 4 cows at Tucows. XMonitor is a real-time computer, email, and remote host monitoring application for Mac OS X. What is XMonitor used for? 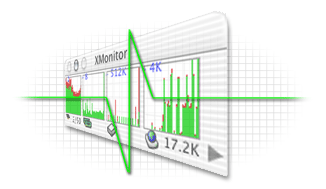 XMonitor allows you to easily monitor your disk, cpu, ram and network usage, PPP status, IP address, Email, and more. XMonitor can also monitor the status of up to 25 remote servers via http or ICMP ping requests. XMonitor can automatically generate HTML reports of past and current activity and graph past performance for up to 30 days. How much does XMonitor cost? XMonitor is Free Software distrubuted under the Free Software Foundations GNU General Public License. XMonitor is now Free software released under the GNU Public License. More than 10,000 lines of code ready to compile REALbasic. Three years of programming work and optimization. [CHG XMonitor] Re-added support for 10.1. See the Documentation for the full Changelog. Visit the Discussion Forums to become a beta tester, discuss bugs, and request features.